Plenty of sandy beaches from which to choose your campsite. Float time is 10 hours. Float time is about 5 hours depending on how you play in the RIVER! Float time is about 2 hours. Beautiful trees and gentle current. Float time is about 6 1/2 hours. Float time is approximately 4 hours. Your four hour trip begins at Stallings Bridge and ends at Canoe and Trail Landing. Children under 12 must wear a life vest! 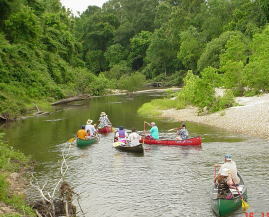 Bogue Chitto River is perfect for tubing. The water is slow flowing as you make your way down stream passing long, wide, beautiful sandbars.....perfect for stopping for a swim or to picnic. Don't Forget - suntan lotion, hat, garbage bag, dry box, change of clothes, towel, etc... Auto Key storage in office is advised! Absolutely NO GLASS or STYROFOAM containers. We have hot showers!